Molnlycke Lyofoam Max (8" by 8", part number 603206) is for use in the treatment of moderate to highly exuding wounds. The polyurethane foam dressing has a waterproof backing film with high permeability, which allows for effective exudation. This is a sterile product. Pack of 6 boxes (10 dressings per box). 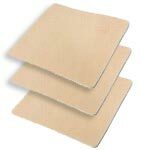 Molnlycke Lyofoam Max (8" by 8", part number 603206) is for use in the treatment of moderate to highly exuding wounds. The polyurethane foam dressing has a waterproof backing film with high permeability, which allows for effective exudation. This is a sterile product. Sold as a pack of 6 boxes (10 dressings per box).